I received a review copy of Keys to Drawing with Imagination by Bert Dodson from F+W Publications. 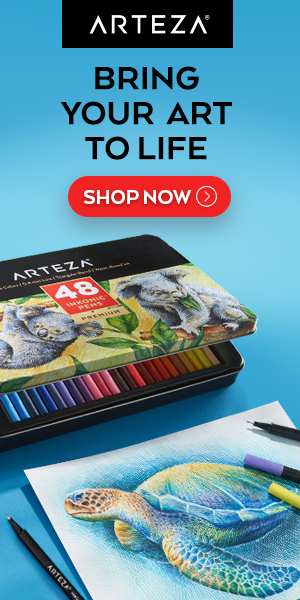 Bert Dodson is a painter, illustrator, teacher and author whose previous book on the subject of drawing, Keys to Drawing is a standard in the field of popular “how to draw” books. In a vein somewhat similar to Betty Edwards’ Drawing on the Right Side of the Brain, it guided you through 55 “keys”, or principles, that were designed to help you see what is actually in front of you, and to draw what you see. It was also designed to stimulate and encourage you, and to have you participating, drawing, right from the start. Although it too encourages immediate participation, the intention of Dodson’s new book, Keys to Drawing with Imagination: Strategies for Gaining Confidence and Enhancing Your Creativity, which I may refer to by the more succinct title, Drawing with Imagination, has a different aim. This is not a “how to draw” book for novices, but, as the title suggests, a course in drawing with, and from, your imagination, and is essentially an extension and elaboration on themes begun in his previous book’s last chapter. Anyone who has tried to come up with concept art for movies or games, design scenes or characters for comics, create imaginative editorial or advertising illustrations or even produce gallery art that deals with the imaginary or the imaginative interpretation of the real, knows that “creativity” can quickly go from an abstract concept to a very real and formidable challenge, particularly when you are faced with deadlines and the prospect of “creativity on demand” (an oxymoron if ever there was one). Dodson seeks to address that situation with a course in imaginative thinking. Unlike many books on creative thinking that try to appeal to writers, business people and a very general sense of “creativity”, this one is focused specifically on drawing. Perhaps most importantly, it is focused on the process of drawing, and how that process can be, in itself, a creative process. The book is obviously meant to be used, not read. The publisher has gone to the extra length of making it spiral bound so it can be laid flat on your drawing table, within a hard cover that has a flat spine so it can be seen on the shelves in the bookstores. Like the original Keys to Drawing, Keys to Drawing with Imagination is divided up into short exercises that encourage you to jump in and begin doing immediately, putting thinking aside for the time being. The free generation of ideas, without interference from the critical part of the brain, is one of the long established principles for encouraging creativity. In fact, most of the creativity enhancing principles in the book are not new (which Dodson readily acknowledges). What is new, and makes Drawing with Imagination successful, is the concrete and immediate instructions and exercises for applying those principles through the practice of drawing. If you are used to skipping introductions to books, make an exception for this one; as Dodson’s intro serves as a concise two page essay on those principles, and acts as a key, if you’ll excuse the expression, to the rest of the book. His exercises encourage you to take the familiar and make it into the unfamiliar, whether by extending doodles into more realized drawings, combining existing drawings, reversing and adding to sketches from life, combining forms, adding elements of texture and shading in novel ways, abstracting simplified graphic elements out of more complex ones, or any of a number of other ways he has laid out to encourage idea generation while drawing. 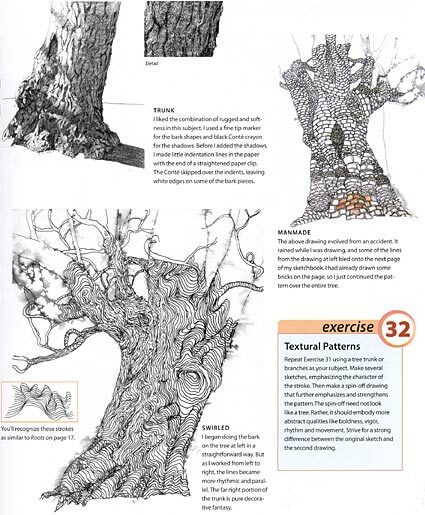 One of my reservations about Dodson’s previous book was that I thought the drawings chosen to accompany the text could have included more gems from the masters, and I wondered if he perhaps felt that very accomplished drawings might intimidate beginners. Here he has taken an interesting tack and chosen, in addition to his own drawings, examples to illustrate his points from unexpected sources, like M.C. Escher, underground comix artists Victor Moscoso (a personal favorite) and Robert Crumb, classic newspaper comics genius Winsor McCay, illustrators George Dugan, Steven Guarnaccia and Trina Schart Hyman, storyboard artist Michael Mitchell and gallery artists Zelma Loseke and Mya Lyn, among others. You can preview some sample pages on the Bert Dodson Studio site (although the image files on the site are of inexplicably poor quality, and don’t reflect the way they appear in the book). Though not necessarily for everyone, artists who deal in imagination and the imaginary, as well as those who want creativity enhancing exercises based directly on drawing, should take a look. It occurred to me while initially thumbing through the book, that here are a few hundred potential levers to wedge your way out of “stuckness”. The “key”, of course, it to take up pencil or pen and apply them. “The desire to draw was born in me.” said William Merritt Chase, in resistance to his father’s hope that he follow him into the women’s shoe business. Born in Indiana, he trained with local artist Barton S.Hays and then at the National Adacemy of Design in New York. He moved to St. Louis and began his career painting still lifes. He became active in the St. Louis art community and, with the help of local patrons, traveled to Europe for two years, in return for paintings and the promise of helping the collectors acquire European art. 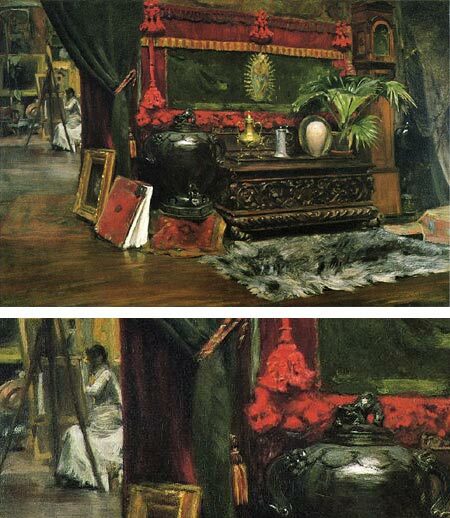 Chase studied there at the Academy of Fine Arts, Munich, a school that was attracting a number of Americans at the time, including Frank Duveneck. Chase traveled to Venice with Duveneck and John Henry Twatchman. On returning to the U.S. he began teaching at the Art Students League. He was perhaps the most noted art teacher of his time and also taught at the Brooklyn Art Association, the Pennsylvania Academy of the Fine Arts, and at two schools that he founded, the Shinnecock Summer School of Art and the New York School of art. In addition to his work in oil, Chase was masterful in pastel and also worked in watercolor and produced etchings. He is renowned for his impressionist style landscapes of Prospect Park in Brooklyn and Central Park in New York, as well as a series painted in the summer sun at Shinnecock. He continued to paint still lifes and portraits throughout his career. 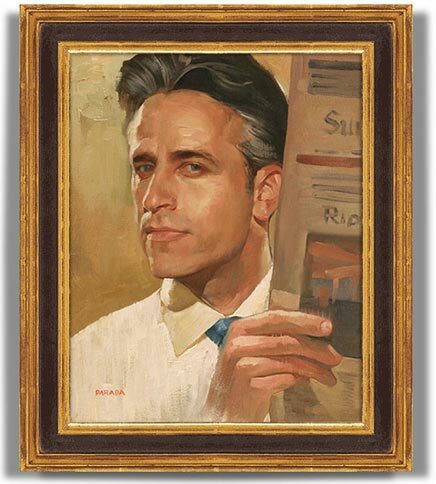 Chase is perhaps best known as founder and leader of the Society of American Artists, a group of avant-garde American artists who broke away from the conservative National Academy of Design in 1877. Members included J. Alden Weir, Albert Pinkham Ryder and John Henry Twatchman. As is always the way, the avant-garde soon became the establishment and several of the Society’s members broke away to form a new group, the Ten American Painters, whose ranks included Weir and Twatchman along with major American painters like Childe Hassam, William Metcalf, Frank Benson, and Edmund Tarbell. Chase joined them when Twatchman died in 1902. All of these painters were influenced by the dazzling explosion of French Impressionism. One of the things that I find particularly appealing about “American Impressionism” is that the American artists seemed less intent on making a complete break with the traditions of academic realism than their French counterparts. The result can often be a blurring of the lines between impressionist color and realist draftsmanship; and Chase is a prime example of this wonderful blend, as exemplified by the image above, A Corner of My Studio. When I first saw this image, I assumed it was digital, but I also assumed it was an instance of digital painting (the use of a pressure-sensitive tablet and stylus to apply color in applications like Photoshop and Painter in a manner analogous to painting with traditional media). I was startled to find that, with the exception of a texture map painted in Photoshop and applied through a material editor, the image was created and rendered in 3-D CGI; in this case modeled in 3ds max 8 and rendered in the Brazil Rio rendering package. 3-D modeling has become very sophisticated in recent years, but still often suffers from a stiffness and artificiality except in the hands of the most adept 3-D artists. In the creation of high-resolution still images (as opposed to effects for film and TV), the depiction of faces and figures in particular suffer from this, and often are heavily painted into afterwards with Photoshop, producing a blend of 3-D rendering and digital painting. Soa Lee is a Korean modeller and art director for game and animation companies. Lee started drawing traditionally and became interested in animation after seeing Katsushiro Otomo’s classic anime Akira. This led her to an introduction to digital animation tools and 3-D CGI (“Computer Graphics Imaging”). She has taken each step in the learning process as a challenge. Disturbed with that same artificiality common to 3-D that I mention, she was determined to learn to manipulate the rendering process well enough to overcome it and produce her final images as 3-D renderings, without having to do extensive touch-up in Photoshop. The results are quite remarkable. Her fantasy-themed images have a feeling of fluidity and naturalism that isn’t often present in 3-D renderings. They also have a remarkable sense of detail, texture, lighting and motion. Their staging and composition reflect her knowledge of drawing (she still starts each piece with pencil sketches) and an eye to the principles of traditional painting. Her site, soanala (roughly, “Soa’s World”) features some tutorials (in the Gallery section), and Imagine FX, the UK magazine about fantasy and digital art, did a feature article and a detailed tutorial about this image in particular in a recent issue (Christmas 2006). Her online gallery also has a selection of images in various categories. Some of the older ones still have that feeling of 3-D, but her more recent ones display her more finessed command of rendering. Sometimes artists can be self-consciously quirky in an attempt to be “different” and carve a niche for themselves. Other times, though, artists are simply quirky because the are. I think Ukranian artist Oleg Denisenko falls into the latter category. 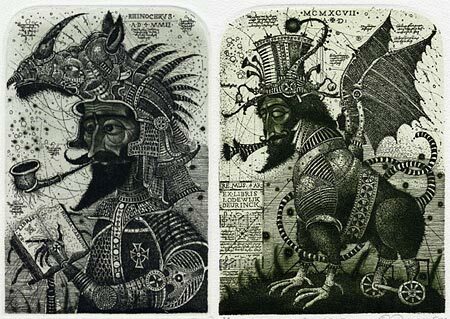 His delightfully bizarre prints of fantastical figures in elaborate armor, often sporting wings and accompanied by armored horses, arcane astrolabes, strange musical instruments, wheels, levers, charts and diagrams are filled with wonderful bits of texture and line. The monochromatic prints have a remarkable sense of being colorful because the variety of textures and line-filled areas have some of the same space-defining feeling as areas of color might in a painting. 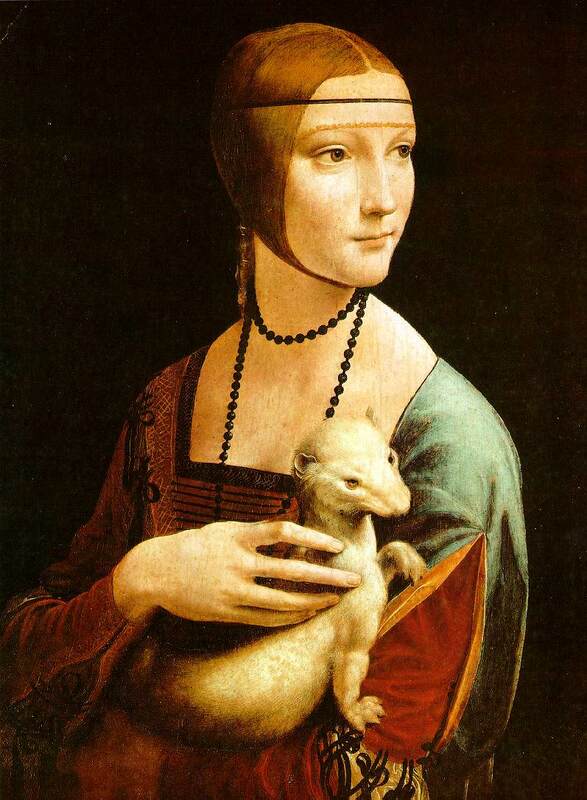 Though the images carry a sense of medieval times, Denisenko was born in 1961. His images spill over with objects from his mental and emotional attic. Wheeled toys, wind-up keys, jester hats, and Da Vinci-like diagrams for nonsensical Renaissance machinery mix with textured amalgams of dragons and birds. Through it all is a wonderful graphic exuberance that makes you think that as soon as he stopped on one image, he would immediately begin the next just because he was having so much fun.